If you’ve been following us on Instagram over the last week or so, you’ll know that we’ve been working hard to bring you something new. Well, today’s the day! And something new it really is. 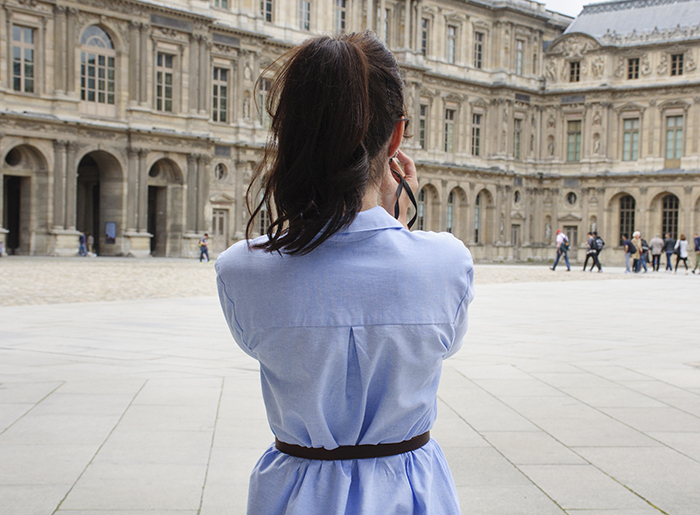 Say hello to our first ever eBook, My Capsule Wardrobe: City Break! We had one main goal when we started this year at Sew Over It HQ: to bring you more patterns. Our minds immediately began swimming with ideas and the concept of a whole collection soon dawned upon us. A capsule wardrobe is something that most of us at Sew Over It are quite far from achieving in everyday life (there’s just too much sewing to be done! ), but we liked the idea of creating a hand luggage-sized wardrobe for taking on a short city break holiday. Lisa’s ideal holiday is a trip to a vibrant new city, taking in the culture, spotting the sights and of course, sampling the local cuisine. Et voila, the idea was born! My Capsule Wardrobe: City Break, a collection of five patterns to take you from day to night on a weekend trip away. But what would those patterns be? We wanted to offer something more modern with the City Break capsule wardrobe; although we absolutely love our range of vintage-inspired patterns, full skirts and nipped-in waists aren’t always the most comfortable thing for a day strolling around the sights. 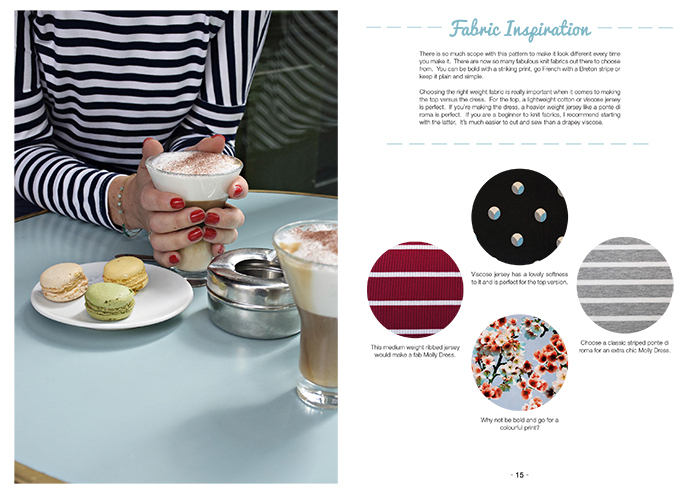 So we have created a contemporary, practical and stylish collection of five patterns that work seamlessly together. Shall we dive in and meet them? Based on the iconic Alexa Chung-style denim skirt, the Erin Skirt is a versatile, stylish staple. It’s high-waisted with a very slight A-line shape and classic button-down front, and comes with two options for length. Go short and cute for a more casual look, or timeless and elegant with the knee-length option. A staple in any wardrobe, a basic jersey top is always a must-have on any city break. Style it up with a breton stripe, or colour block for a more funky look. The perfect pattern to try sewing jersey for the first time, Molly will also be a hit with anyone who likes a quick, satisfying sew. What’s more, make it in a heavier ponte di roma jersey and Molly makes a perfect casual dress. Two-in-one, the Alex Shirt Dress is a versatile, classic pattern that will take anyone seamlessly from day to night. Although always loose and comfy, this pattern can look completely different depending on fabric choices. Made in linen, the shorter Alex Shirt is ideal for exploring the city in the daytime. But choose a lightweight crepe, viscose or georgette and you have a glamorous, knee-length evening shirt dress, perfect for that special restaurant. A quintessential pair of skinny jeans, Mia is the perfect pattern for jeans newbies. High-waisted with a front fly and back pockets, they are fun and interesting to sew as well as being flattering, stylish and chic. The Mia Jeans will be worn again and again. 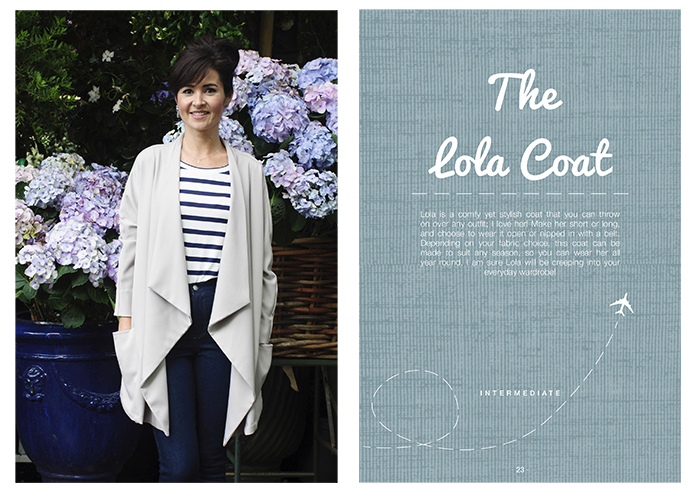 Lola is a stylish yet comfy coat that you can throw on over any outfit! Make it short or long, and choose to wear it open or nipped in with a belt. The Lola Coat can be made to suit any season: in a lightweight crepe it would be perfect for a summer evening cover-up, or choose a drapey wool for keeping warm in the winter. Lola is an everyday wardrobe essential. Because this book is all about city breaks, it would have been foolish to miss the opportunity to go on one for the photoshoot. With so many cities just a short flight away, the benefits of living in London are immense when it comes to city break potential. Florence, Amsterdam, Stockholm, Vienna; we are truly spoiled for choice. But we knew where we were destined for, and hopped on the Eurostar to Paris! Can we have a sneak peek inside? Certainly! Although My Capsule Wardobe: City Break is a digital eBook rather than a printed book, we still wanted it to be absolutely beautiful. 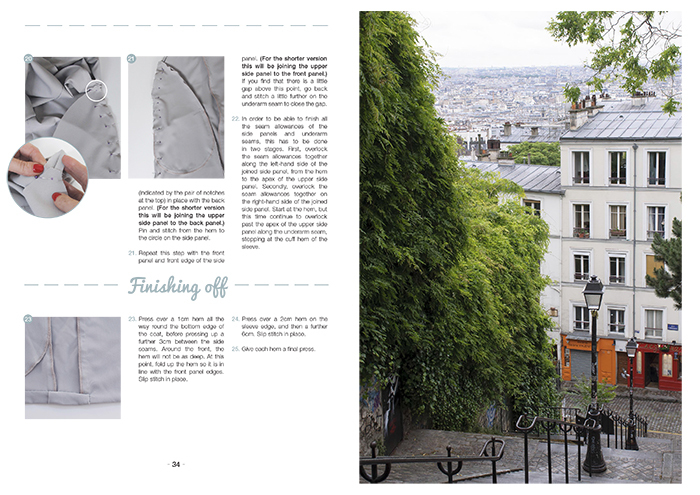 The book is full of gorgeous photographs from our Paris shoot, in-depth step-by-step photo instructions and a myriad of handy hints and tips. Shall we take a look? We recommend different fabric types for each pattern. Check the sizing charts to work out how much fabric you’ll need. 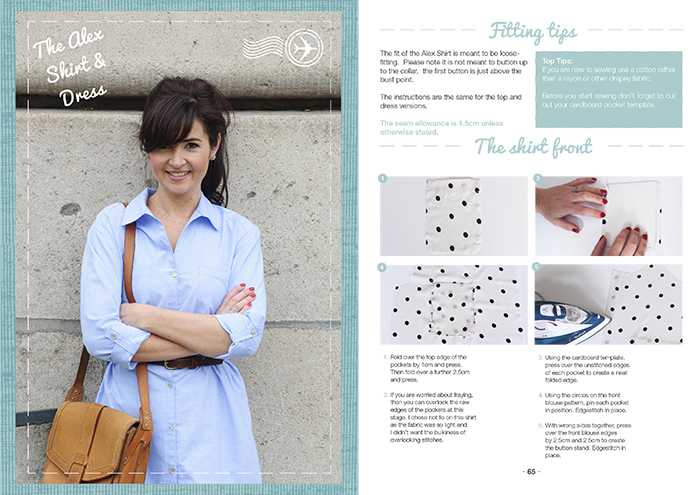 The eBook contains fully photographed step-by-step instructions, as well as a myriad of fitting and sewing tips! 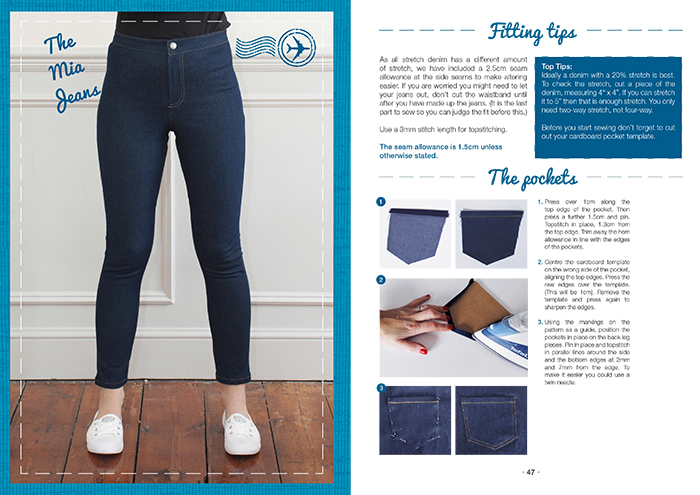 Making jeans is made easy with our Mia Jeans pattern. Lola, Molly and Mia all work beautifully together! 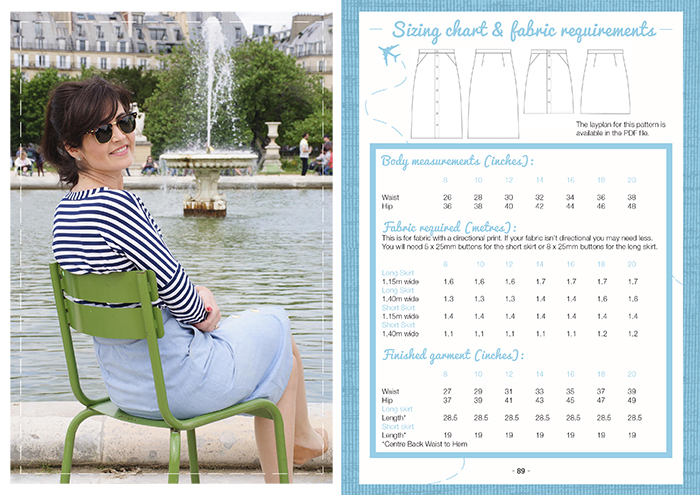 Combine your stitching time with lovely views of Paris for an extra inspiring sew. Who is the eBook aimed at? There is something for everyone in this book, whether you’re new to dressmaking or an absolute sewing whiz. Start off gently with the Erin Skirt and Molly Top and build your skills as you go. The Alex Shirt Dress is perfect for shirt-making newbies; as it doesn’t have a collar stand or cuffs it can be tackled by any confident beginner. The Mia Jeans and Lola Coat take the level up a notch, but with clear instructions, step-by-step photographs and relatively simple construction, they’re not too daunting or scary. We reckon after you’ve had a go, these patterns will become wardrobe staples in no time! Download all the sizing information and fabric requirements by clicking here. What is an eBook and how do I view it? An eBook is a digital book, designed to be viewed on a computer, laptop or tablet. Much like a PDF pattern, once your order is placed you will immediately and automatically be redirected to your Sew Over It account, from where you will be able to download your eBook. The eBook is 93 pages long, 5MB in file size and comes in PDF format. You will also receive all five patterns in PDF format, along with the corresponding layplans and sizing charts. To make it easier for you, each pattern comes as its own file. The patterns are designed to be printed at home on a home printer. If you have never used a PDF pattern before and don’t know where to begin, see our Guide to Assembling PDF Patterns. Download your copy of My Capsule Wardrobe: City Break eBook on our online shop. AND until midnight Tuesday 20th September 2016, save 10% with code CITYBREAK. That’s five patterns for less than £4 each! Don’t forget, we love seeing what you’re making! 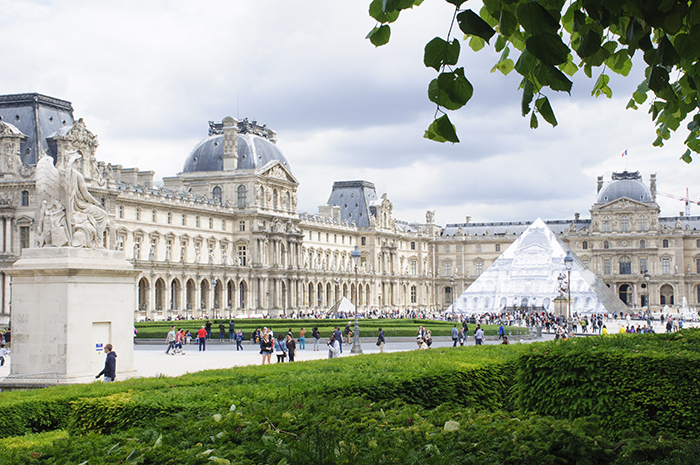 Share your city break makes with #SOICityBreak.